1. 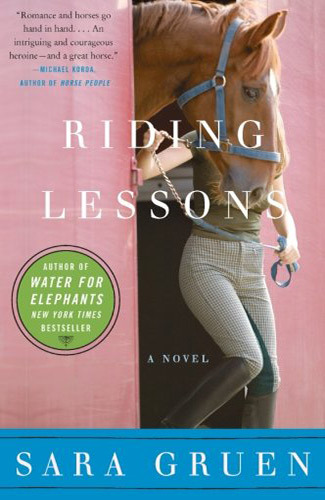 Following her accident, Annemarie puts her riding days behind her and moves her life in a completely different direction. Yet the accident and the loss of Harry haunt her and influence her life in ways she doesn’t even initially comprehend (e.g. she names her dog Harriet). Do you think we can ever truly leave the past in the past, or does it always follow us? Do you think some people are better equipped to move on from tragedy than others, and why? 2. The mother-daughter relationship can be a very complicated one, and it is a theme that runs throughout the book. Annemarie’s relationship with her mother is strained, just as her relationship with her own teenage daughter is. Annemarie says that motherhood never came naturally to her. Do you think that she let her unresolved problems with own mother affect the way she dealt with Eva? Do you think such cycles always repeat themselves in families, or can they be broken? Why do you think the mother-daughter relationship in particular can be such a volatile one? 3. Mutti helps her ALS-stricken husband end his life. Do you think she did the right thing? Even if it was understandable in this case, should she have been punished for breaking the law? Is helping a seriously ill person die the ultimate act of compassion, or is it playing God? 4. During a steamy encounter with Jean-Claude, which she initiates after he comforts her about Hurrah being taken away, Annemarie stops things before they go too far. Do you think that acting on lustful feelings is a typical reaction for someone going through a difficult time? Annemarie knows, even when she approaches Jean-Claude, that she really loves Dan. Do you think the power of love is ultimately stronger than that of lust? 5. Do you think Annemarie does the right thing when she dyes Hurrah’s stripes in order to hide his identity once it is finally revealed? What would you have done in that situation? 6. Annemarie had a relationship with Harry that is unlike any she ever has with a human being, and she forms an equally strong bond with Hurrah. Eva also thrives when she is around horses, particularly Flicka. Do you think that people can have a stronger bond with animals than they do with other humans? What is it that animals can give to us that other people cannot?